One of the biggest misconceptions of the Chinese mobile phone market is that it’s still the epicentre of the world supply of all things weird and wonderful. Time was when all a correspondent needed to do was take a stroll around the electronics markets of Shenzhen, or virtually any major city, and they would leave with details of enough bizarre handset designs, quirky features and ballsy rip-offs to fill a small magazine. Not so today. China, and particularly the manufacturing heartland of the Pearl River Delta, is still the grey-market mobile phone capital of the world. There are hundreds if not thousands of small factories dotted around the cities of Shenzhen, Zuhai, Guangzhou and Dongguan. In the beginning they were owned by Hong Kong or Taiwanese electronics makers, but since then many workers have left to start their own factories. Over the years they’ve managed to tap consumer crazes for DVD players, games consoles, LCD TVs, MP3 players and feature phones. In this last category, many tried to compete with the market-leading brands by producing devices with unusual specs like additional SIM card slots and extra ports, designs mimicking expensive sports cars, and even those incorporating features like sub-woofer speakers and built-in electric shavers. This is classic shanzhai – a word which used to denote counterfeit goods but which has now come to represent a characteristically Chinese kind of micro-innovation. Of course, this grey market also plays host to more blatant rip-offs of leading brands, with handsets sporting names and designs that an IP lawyer would probably not be happy with. Unfortunately for us tech hacks, the times they are a-changing. This industry is dying out as Chinese punters and the countless international consumers served by these factories in southern China swap their old shanzhai feature phones for brand name smartphones. 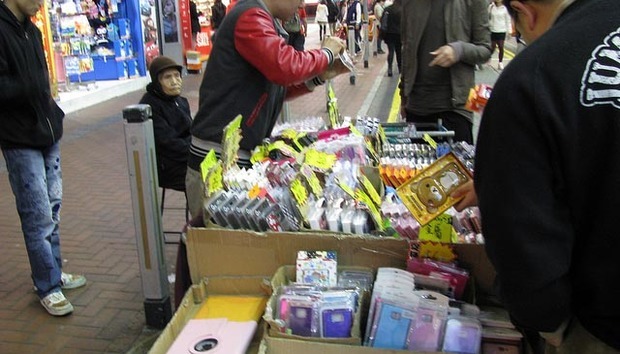 A report from market watcher IHS iSuppli over the summer forecast a slump of 12% in the grey market for mobile phones. From 250 million shipments in 2011, numbers fell to 221.5 million in 2012, followed by another predicted slump to 195 million this year and 174 million by 2014. The big-name brands like Samsung, Huawei, Lenovo and ZTE are helping speed this demise by entering the ultra-low-cost handset market to meet consumer demand. It’s no surprise, then, that back in Q2 2012, smartphone shipments surpassed feature phone shipments for the first time in China, according to IDC. At a push, Hong Kong could be viewed as several years ahead of China in terms of its highly branded smartphone penetration, although, according to the analysts, comparisons with mainland China are not always fair. Still, it’s not a huge leap to make to imagine that as the Chinese phone market matures and wages increase, it will come to resemble Hong Kong as shanzhai sales erode and the smartphone brands dominate. It’s already happening to an extent. A Beijing-based office worker surnamed Zhang told me he’d just bought Apple’s premium gold iPhone. He said he would never buy an unbranded shanzhai device . In Hong Kong, it’s even harder to find anyone not using a modern branded smartphone from one of the major players. Value-added tax differences have created a price gap between Hong Kong and China that sustains grey-market business, especially with high margin, popular models. In fact, this 17% difference in VAT has led to a bold and highly organised smuggling route between the two countries, with Gartner estimating 10-15 million high-end grey-market phones were sold in China last year. These items are the real deal but can be sold on the grey market at significantly reduced prices, explain Frost & Sullivan’s Shuishan. This isn’t to say that branded phones per se are a bad thing: after all, advances in smartphone technology since the iPhone landed have been nothing short of remarkable. However, it does mean that when innovation comes, it usually flows in the same homogeneous direction. By and large you’ll struggle to differentiate the designs of any flagship device from the major players today. One small crumb of comfort for the forgotten shanzhai players of the Pearl River Delta – according to iSuppli, is that the Middle East and Africa are major growth areas for such products, with sales in the region set to reach 38 million this year. It’s a start, but it’s going to take a lot more of the same to save the industry from finally hanging up. John Anderson has been writing about technology and all things Asia for over a decade. From his perch in the Far East he keeps a keen eye on the global significance of emerging trends in the region. John Anderson has been writing about technology and all things Asia for over a decade, having started out on some of the UK's best known best-known IT trade titles. From his perch in the Far East he keeps a keen eye on the global significance of emerging trends in the region. Do you have the personality of a CIO? The rise of the introvert: Is there an IT personality?